Sign up for a generate workshop today. Book your place with your favourite expert today at generateconf.com. 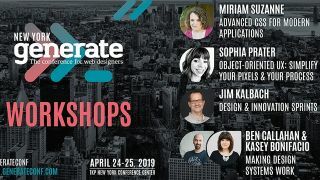 Alongside a host of top-quality speakers, generate NYC 2019 brings with it four expert workshops. Set in the salubrious surroundings of the TKP New York conference center on 109 West 39th Street, the web designer conference is only 10 minutes from Grand Central and Penn Station. First up we have ‘Making Design Systems Work’ with girlscancode.io creator Kasey Bonifacio and Sparkbox founder Ben Callahan. Next, author and CX aficionado Jim Kalbach brings you his Design & Innovation Sprints workshop. There's also a workshop from Sophia Prater, who is running her Object-Oriented UX: Simplify your pixels and your process workshop. The final workshop is brought to you by Miriam Suzanne with her Advanced CSS for Modern Applications workshop. Don’t forget to book today at generateconf.com to make sure you don't miss out. See you there!